This is my initial go at making the hydro-foiling AC72 catamaran, three of which featured in the last America's Cup in San Francisco, two of which were of the same design which I have modelled in X-plane. Fully tacking model, even with a crew (in this case Dean Barker and his team) that cross the boat. Onboard view, you can look from the helm's point of view in 3d cockpit mode. Full hydro-foiling capability, though you need to take the steering slow. Average flight speed of 35kts, the average speed of these boats. 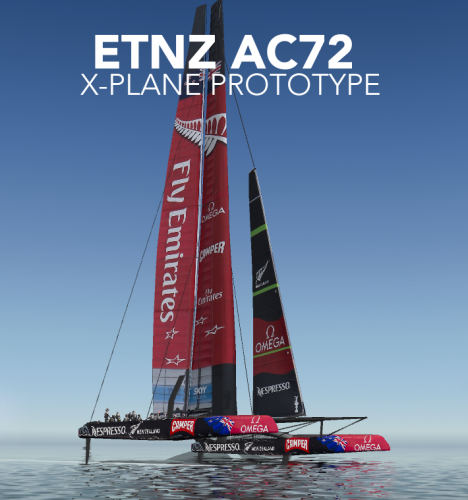 Custom sounds to make the experience realistic Two liveries, respective to the two teams who used this design: ETNZ and Luna Rossa Be Warned: Last year when I made this model, I got it tested on other computers, and it did not tack properly. Something to do with the dataref issue and how my objects were attached. It worked fine for me however. If there is an issue and you can use Planemaker, and have a try fixing the angles of gear retraction until it works. You don't need my permission to re-release an improved version, it's barely a finished model, and deserves more attention. I expect this model to work in V10, however I have only tested this in V9. Unfortunately I made a far more detailed model but it is currently locked in a hard-disk of a failed iMac. Give it a try though! Given that this might be my last upload to X-Plane for a while, I would like to say that X-Plane has been one of the greatest tools in learning my passions during my adolescent years. My first release in 2009, an embarrassing attempt at making a supersonic jet, got me hooked on messing about with the simulator in spare time. I asked dad to use his adobe software to make textures, and I soon learned about basic flight and what it takes to make aircraft as well as how to make paints. Through the process of painting, designing and thinking about my planes, I developed a skill and passion for graphic design and engineering. I am now putting the things I learned to the test in real life, as I am midway through building my personally designed hydro-foiling high performance skiff, as well as taking on graphic design jobs as I finish my final year of school. Without X-plane, I'm sure I would not have had the confidence or experience to do these things as well as I do today. Thanks to the community for their support over the years, and although the detail in professional models is hard to beat in X-Plane 10, don't be discouraged to fiddle about with X-Plane! It could teach you heaps. The Sabre98 is the first plane of a team of young X-Plane enthusiasts, called 98Aerospace. The Sabre98 is a small light, yet fast and nippy plane, that Is used for stunt flying, or a fast light private jet, or a fast commercial post plane. It is a nimble performer, although not enough flap at takeoff can make it pitch down, but otherwise, it is SUPER fun to fly. Crafted to the touch, with well made bodies, real life specs of a honda jet's jet to have more realism, Hi res textures and cockpit, and good looks as well! Who are the team who make up 98Aerospace? This upload is part of 98aerospace moving to X-Pilot.com, we will no longer be active aircraft submitters in the Org. Thanks X-Pilot! 98aerospace whishes to add to your addition of wonderful aircraft. If you have any complaints or would like to say something, write it here or PM one of us. We'll be happy to help! This is plane No. 2 for 98Aerospace, and is pretty good if you ask me! I present to you, the Razor Rj-198. Designed as a really small commuter, to be quick and have a long range to get small amounts of passengers from A to B. Systems include Hi tech wings, two jets with real life specs of one, a small pod at the front of the V stab that produces 48% of the planes energy by having two rotating blades inside, and composite materials. The concept of this plane, for the airline operator, is to shift alot of passengers by a small, low cost plane, instead of a half empty Q300 that costs more fuel. Who are the 98Aerospace team? * Nick kuiper (clod slayer): Head cheese and main modeller. * Hampster: Plane design, texturing. We would like to thank all the people who downloaded and praised our Sabre98, YOU ROCK! Expect more from us in the coming weeks, we will post a plane a week for you to enjoy, all with Hi res textures, cockpits, and more. But for now, bye from the 98Aerospace team! The HCT is also know as the Heavy Cargo Transporter, and is 98's anwer to the current boom in freight technology. In between the size of a 747 and an A380, it is a close competitor to the freight market. It also has better capabilities than the 747 or A380 as it can take off and land at shorter runways. Made up of leading composite materials, and using the best navigational and weight dispursment technology money can buy, the HCT is the perfect answer to a freight company in need of a durable and easy freighter. Realistic spinning turbines in jets. Who are the 98Aerospace team??? Nick Kuiper (clod slayer) - flight model and cheif admin. Hampster - flight model and textures. This was Brent123's entry to the 98Aerospace three week competition. After thinking long and hard on how to make and get the most of our ultra modern day technology, the team at the 98Aerospace lab have created a remote control testbed aircraft capable of performing a multitude of experiments. We present to you the AeroHawk98 UAV, one of the most advanced UAV's out there. With a stall speed of 11 knots, and a max speed of 200, this aircraft is built only of the latest technology. Inspired to sail through the sky like a broad winged bird, it also looks beautiful in the sky and pushes stable UAV aerodynamics. Powered by a small Bio-Fuel engine, the two props are held and rotated inside magnetically charged discs. (One of the latest breakthroughs in our lab). To say least; this bird is built to test the latest 98 tech, and it achieves it's objective. Flight testers advise:To land, get to a low airspeed and close to the ground, then open seedbrakes to assist keeping you on the ground until you come to a stop. We hope you enjoy our enhanced x-plane experience. Just imagine the boneville speed week, inside a tent on the salt, wheeling out 98Aerospace's best ground vehicle yet... I present to you the Jet Car. It is basically an axle with a rocket strapped to it, and it sure goes fast, how fast can you go? This was Hambones entry to the 98Aerospace three week competition. Enjoy! - The 98Aerospace team. Weird goose i decided to edit. Got this from a freind, gave me permission to post. In the middle of the Mojave desert, Burt Rutan and his team at scaled composites wheeled out the model 316 SpaceShipOne from its hangar to begin a day that would go down in history. This is part 2 of my X-Prize duo for X-Plane 9 and 10. SpaceShipOne, for any aviation enthusiast, is probably more notable than any other space craft venture in the history of flight; and it is my pleasure to be able to bring a life size, and detailed model to the wonderful X-Plane community! The previous versions of this aircraft (created by other members) were always too small, only big enough to fit one person, so this is an improvement. It now fits WhiteKnight and many other drop mother ships, more realistically. Just my luck too, as I have managed to release this historic bird with the version 2 release of WhiteKnight! This aircraft can be a bit twitchy in high speeds, this is caused by your frame rate not the flight model. Alge2: Note that he has given me permission to re-create his SS1 model, but unfortunately his model had a bug so I couldn't proceed with improving his aircraft. I will mention him for his kindness in giving me the basis to make my own flight model, and his achievements in X-Plane space flight should be acknowledged. Ultimate Flier: For doing model testing and commenting on performance in X-Plane 9 and 10, thanks UF! Enjoy flying the highly acclaimed space flight phenomenon, and if you like it, rate it! FEATHERING BETA - I used inverted objects under a flap actuated dataref to make the iconic feathering system that made Burt Rutan's design so popuar. I then went on to invert the airfoils so I could get the proper drag characteristics, but this meant that I had to supplement the loss of lift with an extra invisible airfoil. The only way to land this version safely is to turn the thermal rate up to abnormal heights. This aircraft is open to the community to tweak with, there are many problems with flight and therefore this is a beta version. This is a model of the record breaking Vestas Sailrocket. It can only sail on one tack, but uses basic physics to achieve great speeds. I have tried to re-enact Sailrocket for X-Plane as a basic simulation. Although the wind angle is not accurate in the simulator, you can still expect similar handling and lift effects that happens on the real thing. In the real world, the pressures coming off the hydrofoil and the wing sail equal out to create a balanced forward movement. As the speed increases the wing beam on the boat lifts the sail section to flight and the boat is half skimming, half hydro-foiling at about 2.5 times the speed of the wind. The apparent wind speed swings forward so the boat is sailing almost directly into the wind. The offset of the fuselage is designed to point exactly into the apparent wind angle in order to decrease drag. In X-Plane, there is no balanced force coming off the hydrofoil because water resistance underwater is not calculated. That is why you need the wind at the aft quarter of the boat, to blow it along without it slipping to leeward. The model works, but it can only to two thirds of the speed of the wind. Make sure that the wind direction is in the aft quarter of the boat. If you set the wind angle too far forwards the wing sail will stall and you will never get out of irons. It will take a bit of trial and error to get the thing at the right angle, and you can do this by flicking in and out of weather setup menu to adjust wind speed and direction. Once you get it right the boat should just take off and normalize its heading. You will find when you increase the wind speed the wing sail will flip upwards and the boat will fly at a 45 degree angle. Lover the wing flap and this will make the boat level out. I hope you enjoy sailing X-Plane's fastest boat! And if you like it, rate it! The International Moth was quite a challenge to get going in X-Plane. The basic principles of sailing are never easy to replicate, and hours of tweaking in V9.7 left me with this version. I find it fun to play with, I hope you do too! The steering is sluggish, but it does not create drag like a water rudder. The twitchy rudder of the moth, I'm afraid, will never be super-realistic based on the platform I have created. The speed though, does reflect the actual thing, with foiling capabilities at about 9 kts + of boat speed, and a top speed of 21 kts. The model is driven by a jet, not 'sailing' per say, but yet again the chances of getting a wind driven model in x-plane to foil is very unlikely. It's the annoying lack of lateral resistance!